No matter the health issue that your loved one is facing, C-Care can provide the extra care and support needed. Our private in-hospital care can be tailored to meet a variety of needs. We can provide support for a few hours a day, as well as accommodate a 24-hour program for care and can be called up on short notice. This can help relieve some of the demands being placed on family members who must attend to their own responsibilities. Private in-hospital care can provide a direct line to hospital staff if any changes in the person’s condition occur. By monitoring your loved ones over time, the appropriate hospital staff members can be notified quickly to ensure a proper response. In addition, our staff can provide an end of shift report summarizing the events of the day or night. This will ensure that each family knows exactly how their loved one’s day or night went. Professionalism and integrity are vital to high-quality care services. Our caregivers have a positive and patient approach to their daily interactions with both patients and other hospital staff. Above all, family members can rely on private staff to care for the needs of their loved ones. Often, regular visits to the hospital or other health care facility can be overwhelming, time-consuming, and stressful for the friends and family of the patient. To help ease anxiety and offer peace of mind, our competent, dependable and compassionate healthcare providers are ready to offer relief and extra care support. 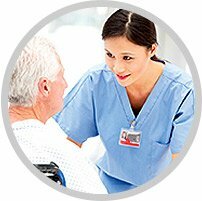 Whether your loved one needs round-the-clock assistance or simply needs help for a few hours, C-Care offers three types of comprehensive Health Services – from basic personal care provided by a Personal Support Worker, to professional nursing care by a Registered Practical Nurse or Registered Nurse. Our staff is available for a few hours a day to complement an existing care schedule arranged with friends and family. It is also offered on a full 24-hour care schedule so that those who have other responsibilities – like returning to work – get peace of mind. To ease a transition from hospital to home or long term facility, C-Care believes in continuous and consistent care. That’s why the staff that provided assistance and support in the hospital will come to the home or new residence to provide the same personal, expert care and encouragement the patient and loved ones have come to trust and rely on. Palliative care is an approach which improves the quality of life of patients who are facing life-threatening illnesses or nearing the end of their lives. If your loved one is unable to receive palliative care in the comfort of their home, C-Care can provide Personal Support Workers to provide additional care in a long term care facility, hospital, or hospice. To schedule a caregiver now or ask us about our hourly rates, contact us at 416-724-2273 or submit our online form.